Hydrogel dressing for skin burns 65x43mm. 5 pcs. EVERYRAYS Italy. Hydrocolloid plaster for cuts and abrasions healing , 45x65mm. 6 pcs. EVERYRAYS Italy. Hydrocolloid invisible patches for acne and cold sores. Diameter 15mm, thickness 175 micron, 10 pcs. EVERYRAYS Italy. Delicate adhesive non woven plasters, 30 pieces. Various dimensions: 10 pcs x 19x72mm, 12 pcs 19x63mm. EVERYRAYS Italy. Waterproof adhesive plasters, ultra thin, transparent polyerethane, hypoallergenic. 30 pieces various dimensions: 8 pcs 25x72mm, 10 pcs 19x72mm. EVERYRAYS Italy. Delicate hypoallergenic plasters for kids in funny shapes and colors. 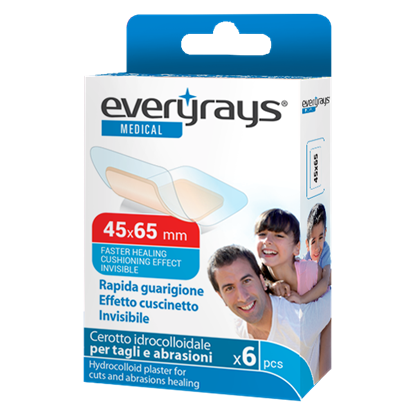 20 pcs various dimensions: 10 pcs 19x72mm EVERYRAYS Italy.